The Mediterranean werewolf strikes a pose. The Copper Age (somewhere between 4500-3300 B.C.) doesn’t get as much play as its immediate predecessor, the Stone Age (courtesy of the Flintstones), or its successor, the Bronze Age, but it’s particularly notable in so far as western civilization’s culturally ubiquitous notions of lycanthropy seem to have emerged as a coherent system of monstrous thought from the murky depths of a common Proto-Indo-European mythology. Linguistic, archaeological, and archaeogenetic evidence seems to indicate that a set of loosely related populations emerged from the Pontic-Caspian Steppe near the Black Sea sometime in the Copper Age and spent the next thousand years spreading out into Anatolia, the Aegean, Western Europe, Central Asia, India, and Siberia, carrying with them certain specific theological ideas that can be hypothesized based on similarities in words for various deities, folkloric themes and cosmological vocabulary. French mythographer Georges Dumézil has suggested that the Copper Age saw the emergence of a common class based ideology in Proto-Indo-European culture (called the “trifuncional hypothesis”) that would characterize all its inheritor civilizations, that is the division of society into priests, warriors, and the unwashed masses. Initiation into the warrior class seems to be the likely source of our notions about lycanthropy, that is, that humans could take on aspects of fearsome critters. World population in the 5th century B.C. was hovering around five million souls, so it’s safe to say that we had not as of yet firmly established our place at the top of the food chain. By way of contrast, as late as 1600 A.D., the North American Gray Wolf population alone was still around two million wolves. It’s safe to assume wolves were pretty much everywhere, and with high intelligence and morphological adaptations to hunting large prey they were the apex predator in most of the ecological niches they inhabited until humans (1) started domesticating them into lap dogs, and (2) put our big brains to use figuring out incredibly efficient ways of eradicating them. It’s no wonder that a Chacolithic tough guy would feel a certain simpatico with the wolf, to the point of incorporating it into transformative rituals that signified a distinction from the commoners. As proto-Indo-Europeans spread into Northern and Western Europe, these ideas presumably travelled with them, and consequently our modern western conception of the werewolf just so happens to be deeply rooted in the Teutonic versions (Iron Age Germanic paganism) that evolved, coupled with a heavy dose of later Christianization. Proto-Indo-Europeans also spread into the Mediterranean, carrying with them a werewolf of a different flavor, what I like to think of as the Greco-Roman Lycanthrope of Late Antiquity. 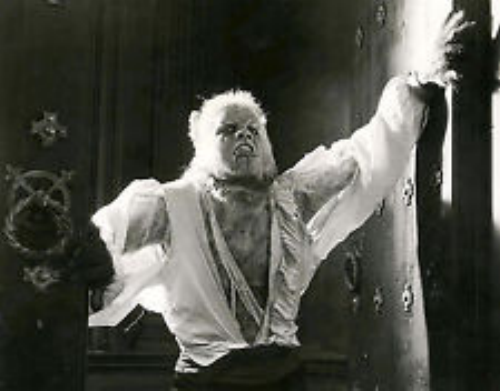 Because the classical Greeks regarded anybody who spoke Greek with an accent to be an unsophisticated brute, and those who spoke no Greek at all to be little better than animals, it stands to reason that they would have associated widespread lycanthropy with those unfortunates doomed to live on the frontiers of Greek civilization by accident of birth. Homer’s Iliad, one of the oldest extant works of western literature, thought to date to approximately the 8th Century B.C., and probably recording oral traditions passed down from at least 1150 B.C., mentions the region of Arcadia (northern highlands of the Pelloponese). More importantly, a semi-mythological king of the Kingdom of Arcadia is held to be a certain fellow named Lycaon (from who we derive the term “lycanthrope”), and is regarded by many as the source of the first written records we have regarding werewolves in the Mediterranean. “The oldest werewolf story on record is that of Lycaon, king of Arcadia, in which however the legend of the werewolf proper is mixed up with another, and apparently a less ancient one, relating to the practice of sacrificing human victims, which seems to have prevailed more extensively and to a later period in Arcadia than in other parts of Greece. Lycaon is said to have been turned into a wolf by Zeus Lycaios, as a punishment for having offered a human victim to the god” (Kelly, 1863, p243). Lycaon wasn’t entirely convinced that Zeus was omniscient, so he decided to test his all-knowingness by serving him human flesh at a banquet. Turns out Zeus was omniscient and was not pleased. Lesson one is don’t piss off Zeus. Lesson two is that they don’t call them “gods” unless they’ve got some juice. Lesson three is that your neighbors tend to look askance at human sacrifice, even when they themselves don’t have indoor plumbing, cell phones, or political action committees. What’s abundantly clear is that the notion of humans transforming into animals (in particular, wolves) was part of the constellation of Greek cultural thought as early as the Homeric Age (1100-800 B.C. ), and appeared as a motif taken for granted as early as the 7th Century B.C., given that the Greek fabulist Aesop (620-564 B.C. ), who rumor has it was an exceptionally ugly slave that won freedom, fame, and prestigious positions through his awesome storytelling abilities, tossed around the idea of the werewolf in a manner that suggested everybody in 7th Century B.C. was on the same page when it came to lycanthropy. A Thief hired a room in a tavern, and stayed some days, in the hope of stealing something which should enable him to pay his reckoning. When he had waited some days in vain, he saw the Innkeeper dressed in a new and handsome coat, and sitting before his door. The Thief sat down beside him, and talked with him. As the conversation began to flag, the Thief yawned terribly, and at the same time howled like a wolf. The Innkeeper said, “Why do you howl so fearfully?”; “I will tell you,” said the Thief: “but first let me ask you to hold my clothes, for I wish to leave them in your hands. I know not, sir, when I got this habit of yawning, nor whether these attacks of howling were inflicted on me as a judgment for my crimes, or for any other cause; but this I do know, that when I yawn for the third time, I actually turn into a wolf, and attack men.” With this speech he commenced a second fit of yawning, and again howled as a wolf, as he did at first. The Innkeeper hearing his tale, and, believing what he said, became greatly alarmed, and rising from his seat, attempted to run away. The Thief laid hold of his coat, and entreated him to stop, saying, ” Pray wait, sir, and hold my clothes, or I shall tear them to pieces in my fury, when I turn into a wolf.” At the same moment he yawned the third time, and set up a howl like a wolf. The Innkeeper, frightened lest he should be attacked, left his new coat in his hand, and ran as fast as he could into the inn for safety. The Thief made off with his new coat, and did not return again to the inn (Aesop, ‘Fables’, “The Thief and the Inkeeper”). While Aesop was clearly telling us to consider the source, the fact that a fear of werewolves was so prevalent that it could be used in a cunning ruse to upgrade one’s fashion suggests a deeply enmeshed cultural symbol that would have been immediately obvious to your average urbanized Greek citizen. By the time of Greek historian Herodotus (484-425 B.C. ), scholars, as scholars are wont to do, were getting a bit skeptical about the existence of werewolves, but nonetheless faithfully recorded their back story, attributing their origin to a migration of Neurian tribes neighboring Scythia, the generic 11th Century B.C. term for Central Asia north of the Black Sea (and suspiciously, what we would consider the “Pontic Steppe” from which the proto-Indo-Europeans emerged). The Neurian customs are like the Scythian. One generation before the attack of Darius they were driven from their land by a huge multitude of serpents which invaded them. Of these some were produced in their own country, while others, and those by far the greater number, came in from the deserts on the north. Suffering grievously beneath this scourge, they quitted their homes, and took refuge with the Budini. It seems that these people are conjurers: for both the Scythians and the Greeks who dwell in Scythia say that every Neurian once a year becomes a wolf for a few days, at the end of which time he is restored to his proper shape. Not that I believe this, but they constantly affirm it to be true, and are even ready to back their assertion with an oath (Herodotus, “Histories”, Book 4, Ch. 105). The Neuri were reportedly a tribe that lived in the vicinity of modern day Ukraine and Belarus and apparently had some serious pest control issues related to snakes. Where is St. Patrick when you need him? In contrast to the more Northern European idea of the ravenous beast that uncontrollably metamorphasizes into a wolf by the light of the full moon and runs amok, the Neurian werewolves were powerful sorcerers that deliberately went wolfen on occasion. This concept did get re-echoed in Western European werewolfdom, but is distinctly related to the Christianized context of lycanthropy generated from a pact with the Devil – courtesy of the Inquisition, but not nearly as popular as witchcraft accusations, although some of the earliest witchcraft accusations that emerged in 15th Century Switzerland included werewolf-related charges. Greek philosophical superstar Plato (428-348 B.C.) equated lycanthropy with cannibalism, suggesting that it was the consumption of human flesh that turned a human into a werewolf. This makes a certain kind of sense in that, when the most common apex predator across the globe has traditionally been the wolf (apart from us), and humans have been competing with the wolf for millennia for our share of the meat biomass out there, there is actually a fine line between human and wolf. Frankly, it’s a good thing we invented pointy sticks. For most of human history we were basically afraid of two things: (1) our insufferable human neighbors, and (2) wolves. According to it, the worshipper who tasted the one human entrail, which was minced up with the other entrails of other victims, was inevitably metamorphosed into a wolf….In like manner, should the commons’ champion find the populace so very compliant that he need make no scruple of shedding kindred blood, should he, with unrighteous charges, as is the wont of such persons, prosecute his victims and render himself blood-guilty, making away with human life, and tasting the blood of his fellows with unholy tongue and lips, should he banish, and kill, and give the signal for cancelling debts and redistributing the land ; is it not from thenceforth the inevitable destiny of such a man either to be destroyed by his enemies, or to become a tyrant, and be metamorphosed from a man into a wolf? (Plato, “The Republic”, Book VIII, vs.565-566). As the Romans of classical antiquity took up the role of apex predator in the western world, gobbled up those smart-aleck Greeks and went on to dominate civilization as we know it for a thousand years, they were all about wolves, from the suckling of Romulus and Remus on down. Obviously, they were big fanboys for Greek myths about werewolves. Roman natural philosopher Gaius Plinius Secundus, or Pliny the Elder (23-79 A.D.), digging through ancient Greek sources, quoted Euanthes (an unknown Greek scholar, likely alive before 200 B.C.) in elaborating on the ancient myth of Arcadian werewolves in Greece. Euanthes, a Grecian author of no mean reputation, informs us that the Arcadians assert that a member, of the family of one Anthus is chosen by lot, and then taken to a certain lake in that district, where, after suspending his clothes on an oak, he swims across the water and goes away into the desert, where he is changed into a wolf and associates with other animals of the same species for a space of nine years. If he has kept himself from beholding a man during the whole of that time, he returns to the same lake, and, after swimming across it, resumes his original form, only with the addition of nine years in age to his former appearance. To this Fabius adds, that he takes his former clothes as well (Pliny, Natural History, Book VIII, Ch.34). Nine years is a long time to be a wolf, if one has known the creature comforts of human civilization. Plus, what good is it to be a werewolf if you can’t taste human flesh. Interestingly, remaining a werewolf is characterized as optional, and if after refraining from human prey for nine years, you find the wolf life doesn’t suit you, you can opt to return to the embrace of your mundane humanity. Ancient Roman poet Virgil (70-19 B.C.) also describes lycanthropy as a choice, rather than a curse, emphasizing in his pastoral poems that a state of wolfishness was obtained through the use of certain “herbs”, corresponding with the notion that deliberate sorcery was involved. These herbs and these poisons, culled in Pontus, Moeris himself gave me—they grow plenteously in Pontus. By their aid I have oft seen Moeris turn wolf and hide in the woods, oft call spirits from the depth of the grave, and charm sown corn away to other fields (Virgil, Eclogue VIII). This refrain, with its emphasis on the choice to become a werewolf is similarly evident in the elegiac works of Augustan Roman poet Sextus Propertius (50-15 B.C. ), incidentally a good pal of Virgil. They probably loaned each other books. Skilled to win even Hippolytus that said “Nay” to love, and ever worst of omens to lovers’ peace, she could force even Penelope to be deaf to rumours of her husband’s safety and to wed with wanton Antinous. Should she will it, the magnet will refuse to draw the steel, and the bird prove a stepmother to her nestlings. Nay, did she bring herbs from the Colline field to the magic trench, things solid would dissolve into running water. She dared put spells upon the moon to do her bidding and to disguise her shape beneath the form of the night-prowling wolf, that by her cunning she might blind jealous husbands, and with her nails she tore out the undeserving eyes of crows; she consulted owls how she might have my blood, and gathered for my destruction the charm that drips from the pregnant mare (Propertius, ‘Elegies’, Book 4, Elegy 5). By the 2nd Century A.D., the Greeks still fancied themselves the pinnacle of intellectual sophistication in the Roman world (even though they had pretty much become a Roman suburb) and just like Herodotus 500 years before them, we see the same skepticism regarding werewolves re-emerging in the works of Greek Geographer Pausanius (110-180 A.D.) when he dismissed a common rumor that a famous Arcadian boxer named Demarchus was also a werewolf. Still, the Greco-Roman conception of the werewolf was incorporated in the popular literature of Classical Rome, exemplified by Roman courtier and satirist Gaius Petronius’ (27-66 A.D.) Satyricon, which related a fictional encounter with a werewolf, but nonetheless included elements reminiscent of the original Arcadian myth. “It so happened my master had gone to Capua, to attend to various trifles of business. So seizing the opportunity, I persuade our lodger to accompany me as far as the fifth milestone. He was a soldier, as bold as Hell. We got under way about first cockcrow, with the moon shining as bright as day. We arrive at the tombs; my man lingers behind among the gravestones, whilst I sit down singing, and start counting the gravestones. Presently I looked back for my comrade; he had stripped off all his clothes and laid them down by the wayside. My heart was in my mouth; and there I stood feeling like a dead man. Then he made water all round the clothes, and in an instant changed into a wolf. Don’t imagine I’m joking; I would not tell a lie for the finest fortune ever man had. “However, as I was telling you, directly he was turned into a wolf, he set up a howl, and away to the woods. At first I didn’t know where I was, but presently I went forward to gather up his clothes; but lo and behold! they were turned into stone. If ever a man was like to die of terror, I was that man! Still I drew my sword and let out at every shadow on the road till I arrived at my sweetheart’s house. I rushed in looking like a ghost, soul and body barely sticking together. The sweat was pouring down between my legs, my eyes were set, my wits gone almost past recovery. Melissa was astounded at my plight, wondering why ever I was abroad so late. ‘Had you come a little sooner,’ she said, ‘you might have given us a hand; a wolf broke into the farm and has slaughtered all the cattle, just as if a butcher had bled them. Still he didn’t altogether have the laugh on us, though he did escape; for one of the laborers ran him through the neck with a pike.’ “After hearing this, I could not close an eye, but directly it was broad daylight, I started off for our good Gaius’s house, like a peddler whose pack’s been stolen; and coming to the spot where the clothes had been turned into stone, I found nothing whatever but a pool of blood. When eventually I got home, there lay my soldier a-bed like a great ox, while a surgeon was dressing his neck. I saw at once he was a werewolf and I could never afterwards eat bread with him, no! not if you’d killed me. Other people may think what they please; but as for me, if I’m telling you a lie, may your guardian spirits confound me!” (Petronius, Satyricon, Chapter 9, LXII). Aesop. Three Hundred Æsop’s Fables. London: George Routledge and sons, 1871. Herodotus. The History of Herodotus. [Olympic ed.] New York: The Tandy-Thomas company, 1909. Pausanias, fl. ca. 150-175. The Description of Greece. A new ed. with considerable augmentations, in 3 vol. London: R. Priestley, 1824. Petronius Arbiter. The Satyricon of Petronius Arbiter. New York: Published for private circulation only by Boni & Liveright, 1922. Plato. The Republic of Plato. London: Macmillan and Co., 1921. Virgil. Virgil. London: W. Heinemann, 1916. Propertius, Sextus. Propertius. London: William Heinemann, 1912. This is a great post. Thanks so much for writing this. It was highly informative but also really entertaining to read. “Sizable populations of wild wolves to party with” that was my favorite part. Great work and thanks again!